Welding is an absolutely amazing and exciting career as it combines art and mathematics. If you are interested in this career, you need to learn more about it and look for available welding training programs. Below, you can find the list of the best welding schools in Vermont where you can get your training. Green Mountain Technology and Career Center offers Beginning Welding classes. It is located in Hyde Park. North Country Career Center provides Beginner, Intermediate, and/or Advanced welding classes. Each group contains no more than 8 students. Northlands Job Corps Center offers welding classes for certification. It is a part of the national job corps mission so it provides work-based learning and “green” jobs training. It means that students learn through on-the-job experience and ready to work in an environmentally friendly economy. River Valley Technical Center has welding classes for high school juniors. Stafford Technical Center offers Power Mechanics & Welding. Completing it, students can apply for different careers such as Metal Fabrication, Structural Welding, TIG welding, and Pipe welding. Keep in mind that every school from our list was approved by the American Welding Society (AWS). One of the most significant points that influence a career choice is the salary. There is some data on the issue. A median salary of a welder in Vermont is about $37 560 per year or $18.06 per hour. At the same time, the top 10% of welders in Vermont earn a salary of $56 030 annually. In comparison, a median salary throughout the country is about $39 390 which is $18.94 per hour. The top 10% of welders throughout the USA earn $62 100 per year. The truth is that welding is an absolutely hard and challenging process but its description sounds rather simple. Welders create some small projects as well as enormous constructions such as bridges and buildings. Welders should be absolutely strong both physically and mentally. Also, they need to be skillful and be able to read blueprints and recommendations properly. Depending on project requirements, welders have to choose appropriate methods and tools to perform their duties. 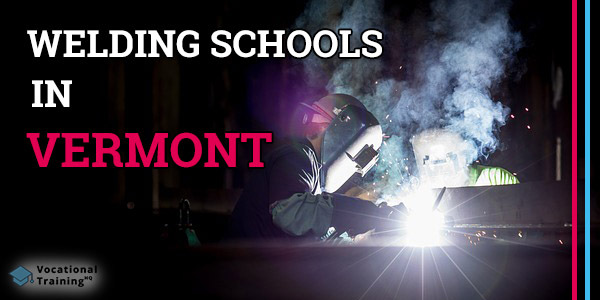 If you want to become a welder in Vermont, you need to enroll in one of the training programs. The main requirement is a high-school diploma or GED. Nevertheless, some schools accept high-school juniors. As soon as your training is complete, you’ll be asked to pass some tests to prove your proficiency. There is a whole bunch of careers that are relatively close to welding. The most similar options are soldering and brazing. They both are about joining metal pieces but still, they differ from welding somehow. To begin with, soldering and brazing require lower temperatures to connect metal pieces. Moreover, welders don’t use any additional material. At the same time, both soldering and brazing require the use of so-called fillers that help to join metal pieces. One significant point is that brazing allows creating stronger constructions than soldering while welding produces the strongest constructions. As it was said before, welding is an absolutely rewarding and exciting career. Also, it’s pretty easy to get your certification. You just need to choose a training program and meet some simple requirements. Learn about available programs and make your final decision.